He has a degree in Business Administration from University Francisco de Paula Santander (UFPS) of Colombia. He has a M.A. in Latin American Studies with a concentration in Government Security from the Edmund A. Walsh School of Foreign Service at Georgetown University. 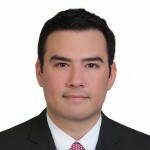 Previously he served as Programme Officer Young Americas Business Trust (YABT), and since 2007 he has been linked to the CICTE Secretariat of the Organization of American States (OAS), where he serves as Program Manager on Cyber Security. From his position at the OAS / CICTE, Belisario could be part of progress in strengthening Cyber Security in the Americas.